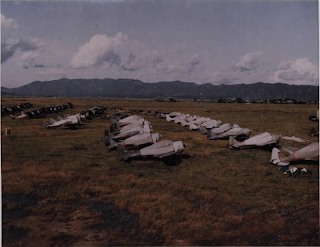 This fascinating colour slide of Ki-55 aircraft lined up on an airfield near Kyoto Japan in September 1945 can now be viewed in greater detail at the National Archives (NARA) using their neat magnifying tool which enlarges without losing definition. The various colours are interesting but also the flying school markings overpainted on the fins and rudders can now be made out. The black or dark grey painted aircraft were probably being prepared for dawn and dusk special attack operations. Note the hue of the yellow biplane trainer in the background and the near off-white appearance of some of the Ki-55 trainers in the row to the right.